Time to Buy Gold and Silver? If one had gone along with the view of many gold bugs towards the end of 2013 then by now expectations would be for Gold to be trading well above $1,800, instead Gold has been trading at new lows for the year and Silver making multi-year lows with some commentators even suggesting that the Gold / Silver bull market may even be over. Furthermore that there was a 40% risk that Gold would close down on the year, whilst net probability favoured Gold targeting $1760 by year end. Therefore with gold having fallen to a low of $1540, and Silver $26.60, then this does appear as an opportunity to accumulate for at least the existing trading range, as expectations now should be for Gold to target the upper end of the range to $1800. However whilst most eyes are on Gold, I concluded that more volatile Silver is likely to offer a better opportunity to accumulate towards a significantly larger trading range. Silver offers the better long-term opportunity in terms of risk vs reward off of the lows due to expectations for a deeper discount and greater long-term potential. Many commentators have written at length of the risk of Gold and to a lesser extent Silver being confiscated by the government, however the news of Cyprus having shocked the market that bank deposits can also be confiscated which at some point is going to obviously benefit commodities such as Gold and and Silver. Add to that Japan tripling QE money printing that in due course countries such as the UK and US will seek to emulate then that adds to the probability of Silver being at an opportunely priced moment at the low of a 3 year range. Elliot Wave Theory - Implies Silver has further to fall, i.e. that Silver is in Wave C of a larger ABC that seeks to correct the whole bull market to $48. Trend Analysis - Whilst last Friday Silver strongly bounced off of multi-year lows of $26.60, however the price firmly remains in a down channel that currently has resistance at $30. Support & Resistance - Silver is in a wide trading range of $26 to $35, having recently bounced off the lower end of the trading range. The bottom line is that Silver tends to be leveraged to Gold towards the later stages of its strong bull trends. Therefore Silver will continue to lag until there is a sustained bull run in Gold first as many precious metal investors will only awake to its relative cheapness after Gold has already moved. As things stand with forecast expectations for Gold to next target $1800, then Silver should eventually follow suite and out-perform on a percentage basis given the more volatile trading range, however at $27, Silver has given no clear sign of a trend change and therefore only indicates as a low trading range longer term investment accumulation opportunity rather than for a large shorter term investing exposure or in terms of position trading. The SLV ETF shows that it tends to track silver quite closely even over the long-run with very little observed decay, unlike a number of other commodity ETF's such as UNG for natural gas which are designed to lose investors their money. So SLV can be used both for trading and longer term investing purposes. 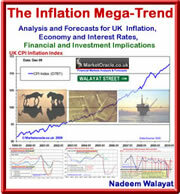 For sterling investors in commodities such as Silver it is not just good enough to have a rough guide of what the technical picture is for a commodity in terms of dollars but importantly also in terms of ones domestic currency, in which respect the recent downtrend of sterling from £/$1.63 towards £/$1.49 has had the effect of lessening the fall in $SLV, hence why SLV has failed to make a new sterling low. Equally, as Gold and Silver rise it can be expected that the US dollar will weaken which means a significantly weaker sterling SLV rally i.e. spot $ SILVER moving to $35, for a 30% gain translates into a sterling SLV gain of about 20%. Whilst a far more powerful up thrust to SILVER $42 or 55% would translate into GBP SLV gain of about 45%. Whereas the risk is that Silver falls to $17.5 for a risk of 33%, / GBP SLV risk of also 33%. So the potential for a Silver investment now is for about an 50% gain for a 33% risk. In terms of trading silver with a stop at $25.5 for a limit of $42, so a risk of 5% for a 50% gain (10-1). The risk being one is stopped out before the target is reached. To complicate the picture lets throw Gold stocks into the the mix, which about a 1/3rd of the time are in synch with the gold price, 1/3rd with general stock market indices and 1/3rd just go on a random walk of their own as the following chart illustrates one of severe under performance of the HUI Gold Bugs index against the Gold price. This explains the reason why Gold stock investors so often get it wong because they cannot detach themselves from what the gold price is doing instead as I often state what one needs to do is to focus on the actual market / stock that one is trading or investing rather than obsessing over an assumed inter-market relationship. The bottom line is that Silver is currently under valued against Gold because Silver lags Gold as it tends to only outperform towards the final blow off stages during which time it catches up to and over takes the Gold price trend. Current price action is near the extreme of under performance against Gold which given the fact that Gold is still in bull market courtesy of the exponential Inflation Megatrend which means that despite lack of any buy signals for trading purposes, Silver is at a point in it's trading range that I personally will to start accumulate a long term position with the goal of ultimately banking profits on a breakout to a new all time high. However, I am not going to speculate on when that could happen because as this analysis illustrates it has far too many obstacles in its way at this point in time i.e. such an event could be 2 to 3 years away. Your analyst accumulating Silver for a long-term Price Spike. 09 Apr 13, 19:21 Gold, Commodity or Stocks? Do you see buying SLV as increasing or part of your Stock bucket or this is a different area of investment like Commodities? Or if it that you see both the same since they trade in the stock market? Still sometimes precious metals price and the stock market indexes are correlated and other times not. I group commodities with stocks because they are similar risk. Stock and commodity sectors rotate, so individual stocks and commodities have more in common than one thinks. The real big difference is that most stocks pay dividends, which is why hard commodities and their ETFs rarely go above 4% of portfolio. Instead I prefer the likes of oil, gas, agricultural and mining stocks which tend to be better long-term commodity plays. Thank you for your reply, and sharing your wisdom and experience. BTW, I am applying your advice given some time ago, how to build a system, and I made some satisfactory progress, although I have not completed the task yet, I am still working on this, and am far far away from your level of analysis and understanding of the markets. Thank you for your guidance with your messages. With gold almost down to $1200, What are your current thoughts? I've invested 2% of my assets, mostly in silver, my target for exit is $47. The last time I heavily accumulated was in late 2008 at around $11, it subsquently fell to near $8, before I exited some years later around $29. I'd be interested to hear your updated thoughts on gold and silver. Since your last article (back in April), gold and silver have fallen through several levels of support and seem to be fully out of favour in the media - which now makes me think they're probably a good buy! There seems to be a strong view in the US that because food and energy prices are not surging higher there is no inflation, despite the fact that the DOW is powering forward - whereas this isn't seen as being connected to inflation! Do you have a view on whether gold and silver will reverse any time soon, or do you think they are likely to remain unloved for some time to come? Yes, Ive not looked at Gold and silver since Apri because they are a tiny part of my portfolio, approx 2%, my primary focus is housing and then stocks, but I will look at Gold again in the run up to the new year.